Simple dream catcher decorated with feathers and beads. 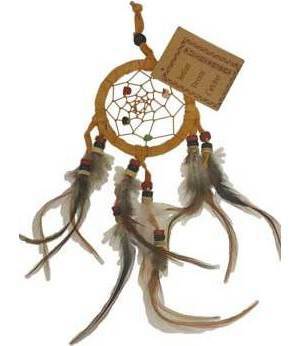 These are often hung above cribs or in the windows and above doorways of the rooms where childeren sleep and sometime near the sleep area of adults with troubled sleep to catch the bad dreams and the spirits who send them within the web of the dream catcher. Hoop 2 1/2".